He co-founded the physical theatre company UMO Ensemble in 1989, and co-created and toured 14 shows, logging over 1000 performances as a buffoon, clown, etc. with UMO before retiring in 2001. He was part of the producing team of the first Seattle Fringe Festival in 1992. 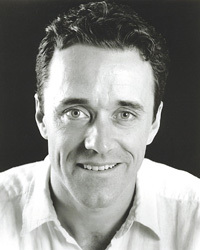 He has created two one-man shows: A Head is Very Fragile (written by Willy Monigold), and the award-winning A Pale and Lovely Place, directed by Kevin Kent, and seen at ACT Theatre and other venues. He directed and performed in 7 different shows at the Dinner Circus/Cabaret Teatro Zinzanni in San Francisco and Seattle over five years. Currently he runs EnJoy Productions, along with his partner Martha Enson. which produces theater and live entertainment for special events, as well as music, videos and interactive inanity. He is the Creator and Host of the TV variety show Big Night Out, and a host/emcee/comic for 50 events a year, from the Moisture Festival Burlesque shows to private parties to corporate event.. An avid singer/songwriter, Kevin’s CD Say It is available on CD Baby. For 20 years Kevin has lived on Vashon Island, off Seattle, Washington (USA).